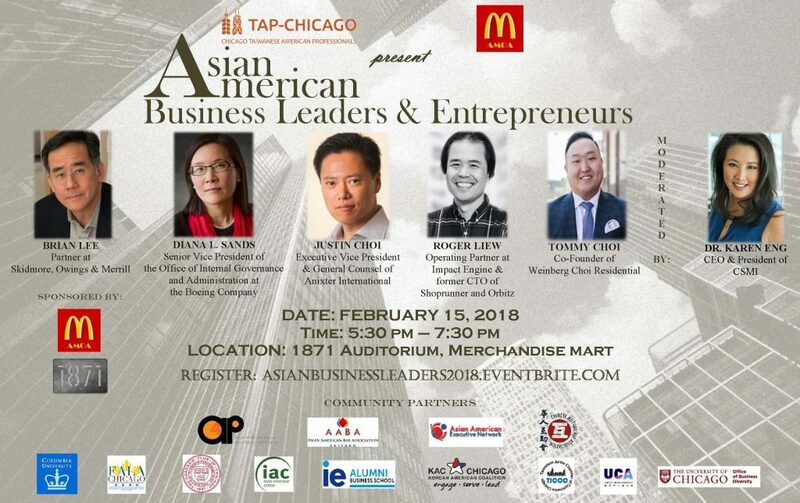 On Thursday, February 15, 2018 join AMOA, 1871, and community partners at the 1871 Auditorium inside the Merchandise Mart as we hear from prominent Chicagoland Asian American leaders and entrepreneurs. The panelists will discuss their journeys to success and offer advice to those seeking to advance their careers or start new businesses. There will be a networking reception following the discussion and Q&A. Light food and beverages, both alcoholic and non-alcoholic, will be served. Listen to a panel of prominent Asian American business leaders and entrepreneurs as they discuss their journeys to success and offer advice to those seeking to advance their careers or start new businesses. A networking reception with light food and beverages will follow the panel program and Q&A. Post in Blog, Past Events, Professional and Leadership Development, Uncategorized | permalink.